TORONTO – Troilus Gold Corp. has announced a bought deal public offering of common shares that will raise approximately $12 million. The shares are priced at $0.85 each. The shares will be purchased by a syndicate of underwriters co-led by Canaccord Genuity and GMP Securities. The underwriters have been granted an over-allotment of 2.1 million share that would, if fully exercised, raise an additional $1.8 million. 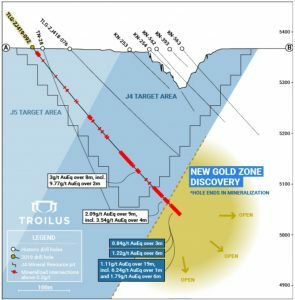 Troilus would like to restart the open pit and develop the underground portion of the deposit. Indicated open pit resources are 97.5 million tonnes grading 0.76 g/t gold and 0.078% copper and inferred pit resources are 21.7 million tonnes at 0.60 g/t gold and 0.062% copper. The underground resources total 24.2 million indicated tonnes at 1.32 g/t gold and 0.121% copper, plus 14.5 million inferred tonnes at 1.31 g/t gold and 0.115% copper. Subscribe to news release updates at www.TroilusGold.com, then watch the corporate video.